Golmaal by Shirshendu Mukhopadhyay is a popular Bengali novel which is written by Shirshendu Mukhopadhyay. The book was first published from Kalkata and it is another popular book of Advuture Series. Shirshendu Mukhopadhyay is popular Indian Bengali Writer. He was born on 2nd November 1935 in Mymensingh, Bangladesh. After divine India & Pakistan in 1947 his family was shifted India. He is popular among children and young. He is graduated from Culcutta University. His popular books are Hirer Angti, Manojder Adbhut Bari, Bikeler mrityu, Manobjomin, Banshiwala, Warishe, Valobasha, Ghunpoka, Sadhubabar Lathi, Gayer Gondho, Dicarini, Ujan, Nrisingha Rahasya, Durbin, Parthibo, Bangaler America Darshan, Tanki Saaf, Gourer Kabach, Vuture Ghori, Goshai Baganer Voot, Boxer Ratan etc. Now a days He is more popular living Bengali Author. 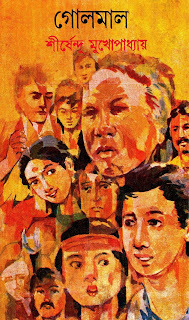 Download Shirshendu Mukhopadhyay Bangla Books, Novels, Articles, Stories in pdf format and Read Golmaal by Shirshendu Mukhopadhyay.